A different kind of a Food Blog. Food, humor, stories and a bit of roleplay. One may wonder why Tis' Captain be sailing in this Andheri region for so long. But The Captain always thoroughly explores big islands. Today's destination be Le Berian's in the outer reaches of Andheri Lokhandwala. Traveling between the busy lanes, I finally reach me destination. With a Knife and fork in me hands, I kick the gangplank open and walk towards Le Berian. Le Berian is a catchy little name. It sounds French but yet it doesn't mean anything in French. It also has an uncanny resemblance to librarian. Legend has it that the owner felt Biryani Something or Something Biryani nomenclature for Biryani joints was a tad bit over used. So the owner came up with something original. Not only is the name catchy, it tends to linger in your head for a while. Le Berian classifies itself as a Quick service restaurant although it is more of the home delivery type of place. Sit at the comfort of your home and use the food phone (completely unrelated to the bat phone) to order yourself some piping hot Biryani. Or be a little adventurous like me and make a trip to the restaurant itself. Since Le Berian is a delivery style restaurant, its in-dining facility may not appear luxurious to some. But yet it has made good of what it has. Despite being just two-storey high, its still a roof top restaurant. 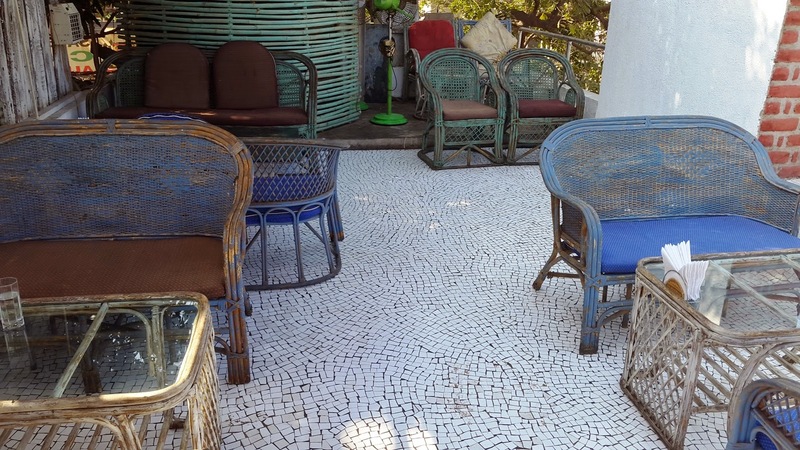 In what I would describe as a Dhaba meets roof top, Le berian actually has a decent dine in. The place looks enchanting at night. Don't take my word for it, see it for yourself. The place is a real hidden gem. You deserve to treat yourself, go forth. Captain : I will sit on the table under the mango tree. Crewmate : Captain, my table is better and well shaded. Lets sit here. Captain : All right lad, lets settle our choices like true men with a game of ... rock scissor paper. Although, it does not come without its flaws. The view on one side is full of shanties and old establishments. And there is also a fly issue in the dine in area. I literally found myself naming a pesky fly who wanted to desperately sample my grub. The service is good although there is just one hard working server. So it could be slow at peak times. The server however knows his game well. He will accurately describe the dishes and help you with your choices. Not something, most restaurants have these days. The journey started off with an initial glitch since the place did not have my first Kebab choice available on the said day. But the Kebabinator within me was not disappointed. Lay thine eyes upon this succulent whopper. Recommended by the informed server, I ordered the Reshmi Kabab Tikka. The portions were rather large and it calmed my ravenous appetite. The Kebabs were medium rare, well marinated, creamy and rather juicy. The chicken breasts were quite aromatic too. An authentic Tikka taste with a hint of cream and a slightly tangy center would be my tongue's explanation for this item. I made sure that I did not leave even the tiniest shred of meat in my plate. The item was not greasy at all and did feel quite light. Appetizing indeed. Captain : Oh you don't like it? That all right, I shall eat yours then. Crewmate : Hey, I was only saying that its the best. Give me back my plate, Captain ! Up next was a plate of Kaali Mirch Tikka Kebab because one plate does not complete the ritual of satisfying the Kebabinator. 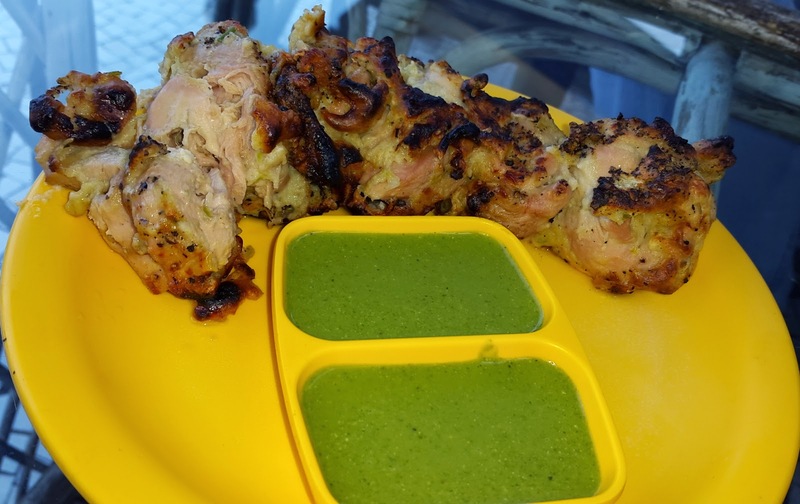 Being a tikka type Kebab, its cooking usually follows a similar procedure as the Reshmi Kebab Tikka and they even appear the same. But the taste is different indicating a marked difference somewhere in the procedure. 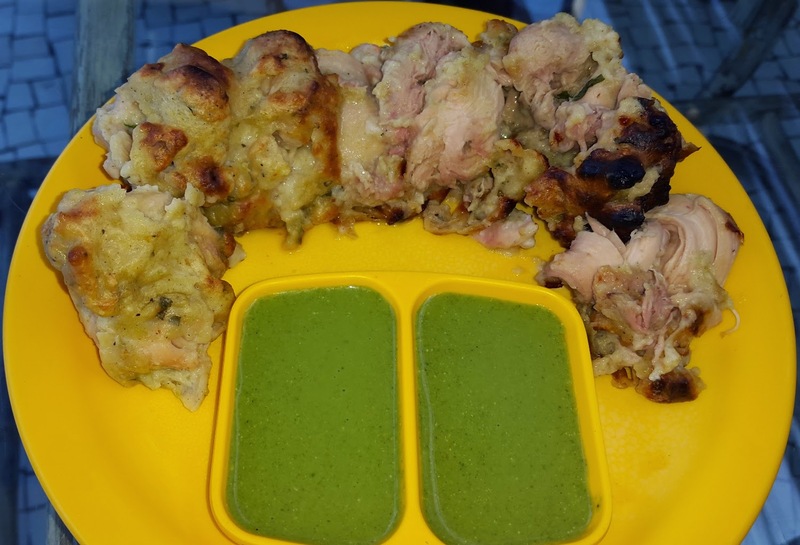 The Kaali Mirch Kebabs appear to be roasted a bit more and are not tangy in the center. The flavor of fresh black pepper corn also dominates the product. So while Reshmi Kabab was more of the creamy yoghurty-melt in your mouth type, Kaali Mirch tikka are pepperomatic kebabs. Well nuances aside, the Kebab was great. I find it tough to choose a winner between the two kebabs but I think Reshmi Kebabs get the ridiculously over sized trophy cheque. What is Le Berian without its flagship Biryanis eh? Presenting the Chicken Afghani Tikka Biryani. 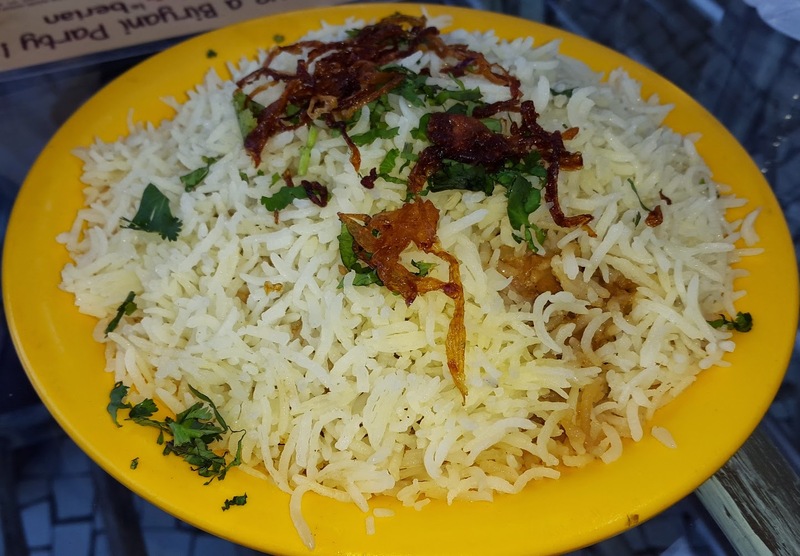 Made with good quality Basmati rice, sprinkled with aromatic spices and low on grease. This was an almost perfect Biryani. Its great for those who are sensitive to hot spices. Since it is low on chilly and pepper content, it would serve well to both Indian and International patrons. Having American friends over ? Fancy some genuine Indian food? Who are you gonna call? Le Berian ! The chicken chunks were tender and tasty with the flavor having reached the softest depths of the Chicken. But the only flaw I found in this variant was that the rice felt out of sync. The flavor of the chicken was great but the rice felt like the unwilling companion. Minor flaw since the taste was 80% there. I wouldn't say that it is was unsatisfactory since I did finish it completely. When God felt that Man was making crappy food, God shrugged and gave Biryani's recipe to man. And Le Berian's Bohri style Lamb Biryani is the epitome of a how a good Biryani should be. 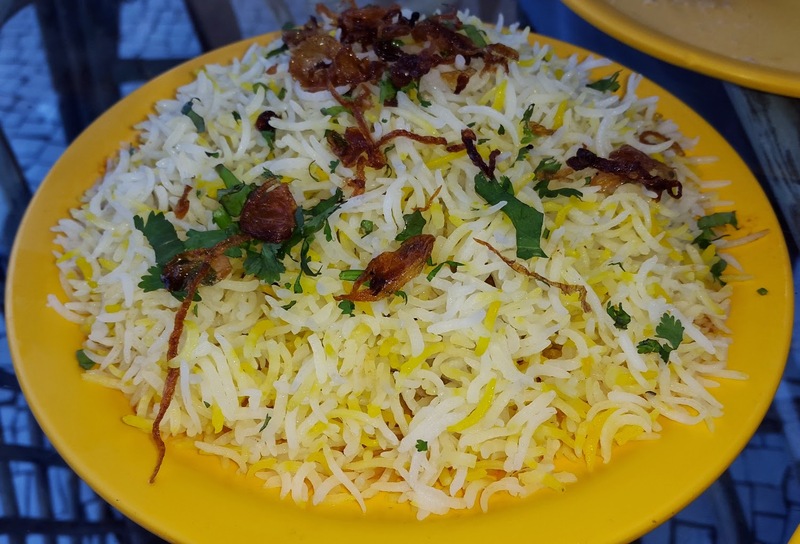 It is moderately spicy, loaded with flavor, low on grease and made with two kinds(or atleast two colors) of Basmati rice. Billed as Le Berian's signature specialty, it lives up to the hype. I ate each bite fondly and relished the flavor promptly. The Mutton was cooked in a unique blend of spices and tasted great. As I chewed the tender meat, the flavor pampered my spoilt taste buds. The rice was equally impressive. The flavor had latched on to the rice perfectly and the ingredients were at perfect harmony with each other. The bulk of my rave for this place comes due to this item alone. If you think you have tasted good Biryani, wait till you try this. Captain : I think we should have this every week mate. Crewmate : I concur. But what if other lads disagree? Captain : Then off the plank they go. 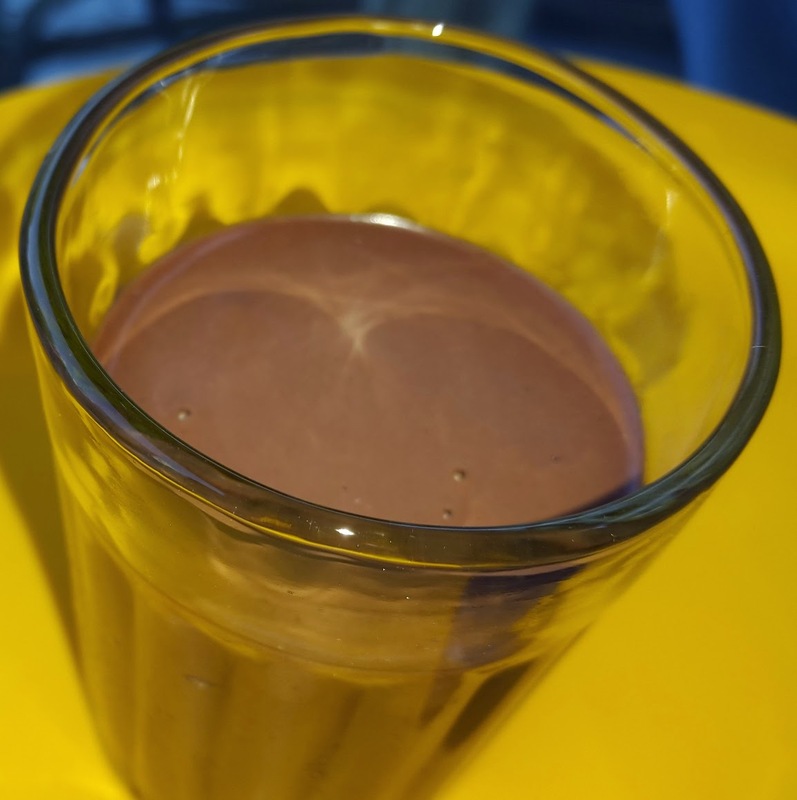 Initially, I thought that I was served with Cutting Chai as a dessert but despite its resemblance to Mumbai's favorite tea, the concoction in the tea glass happened to be chocolate mousse. Named Chocolatewala love, it was an egg-less chocolate mousse. While I am not fond of Egg-less mouses, this variant branded itself an exception. Made with a thick, bitter sweet and rich chocolate liquor, this variant does come close to a proper egg containing mousse. The taste was rich and the consistency just right. As a testament of its consistency, I could hold the glass upside down and it would not leak out . And finally I had the Saffron Phirni. What a fitting dessert for a Biryani joint. Phirni ! 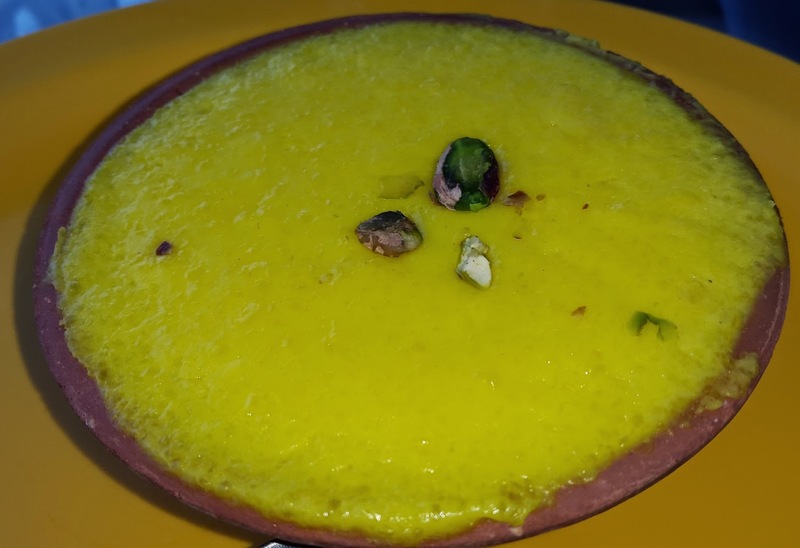 A saffron flavored rice pudding, this was clearly the better of the two desserts that I tried. Served in an earthen bowl, its flavor was enriched by its presentation. The rice grains were properly blended. Unlike average Phirnis where you feel intrusive large grains of raw rice coming into your mouth, this one was perfect. The liquid concoction was well made. And it makes a proper end to an Indian Biryani fare. You do not jump out of a plane without a parachute, so why have your Biryanis without a Phirni? To conclude, I'd say that my Le Berian experience was great. The ambiance bugged me a bit, literally. But the food fixed everything. All is forgiven. Whether you choose to have your grub at the restaurant or in the calm vicinity of your home, Le Berian's food is a good choice. "The sun sets in the west and the winds fly east. This be the time to raise the sails and move towards the horizon's edge." During one of me island runs, I sailed through well known waters. Several islands dotted with hundreds of restaurants passed me way. Too much choice as the crew looked at me to make a decision. I finally decided to drop the anchor at a reputable pizza place. The place appeared small but promised better food. I just decided one day to land in Andheri Lokhandwala and try out the nearest reputable restaurant. I called it my weekly epicurean quest or Foodie run for those with vernacular appetites. Being in an area full of restaurants, I got confused easily. So I pulled out my phone and browsed nearby restaurants. And I decided to choose Debonair because...it was the closest place nearby and had a decent Zomato score. 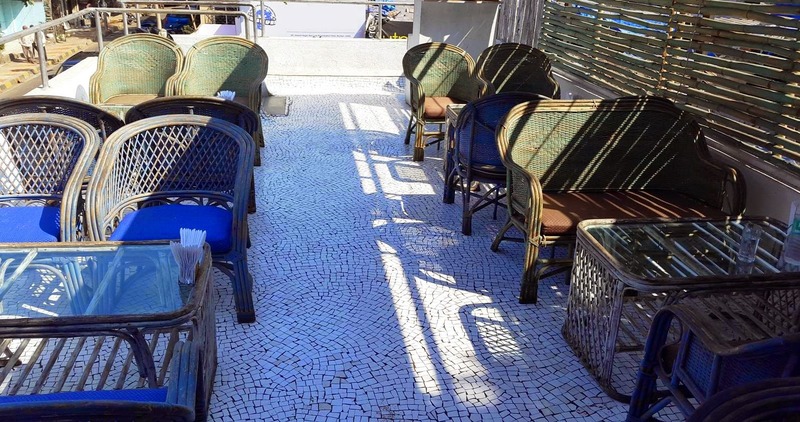 However, my enthusiasm reached a plateau when I found that it was more of a takeaway place with a small Al Fresco for diners who preferred eating there. Captain : I am having second thoughts mateys. So much smoke and noise. Crewmate : Maybe we should take their advice Cap. Order Pizza instead. Captain : Have you gone Bonkers lad? Who would deliver across the sea? The crew was a bit pushy, trying to convince me to order instead of dining on spot. I smiled and told them how far I lived then they took my order. There was some special offer going on and I would get a smaller pizza over a larger one for free. Good for people nearby I guess. Free pizza is always good. The Al Fresco is not very impressive. Flying insects, smoke from the nearby main road, too much noise and the curious passers who love to stare at what you are eating. But well, the place is a take away joint after all. 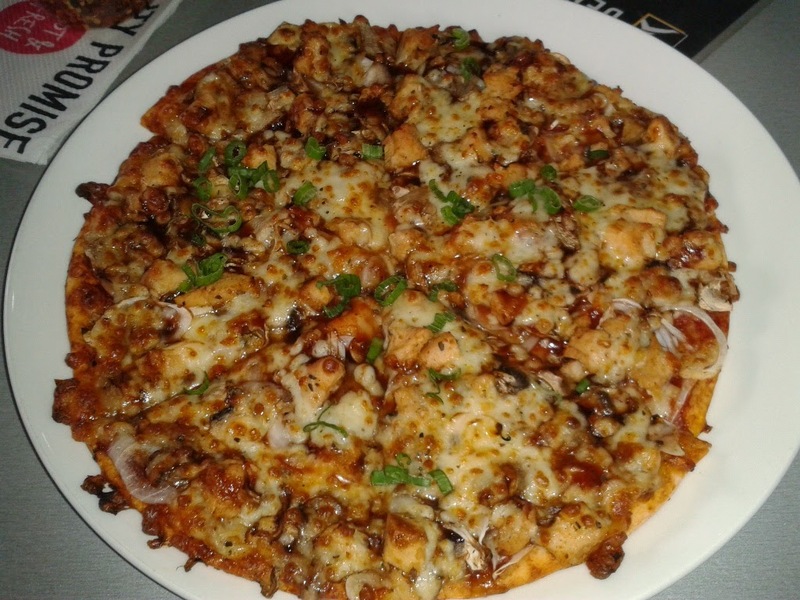 The Barbeque Chicken pizza was very mediocre in taste. Not something, I would rave about. The base was the standard bread found in most run of the mill pizza parlors. The cheese was ample but the the barbequed chicken was a downer. Too many greens for my comfort as well. The taste was mild and I had to load it with Oregano seasoning to get somewhere. This pizza was still better than what I am used to having at Dominoes. But still scores much below Smokin Joes and Pizza hut. The pricing feels affordable with the offer so it makes it an attractive option compared to Pizza hut. Good to go if you want a quick pizza fix at your home. Not that good of a choice if you are on the hunt and looking for good pizza. The greasiness can be on the annoying side of the spectrum too. 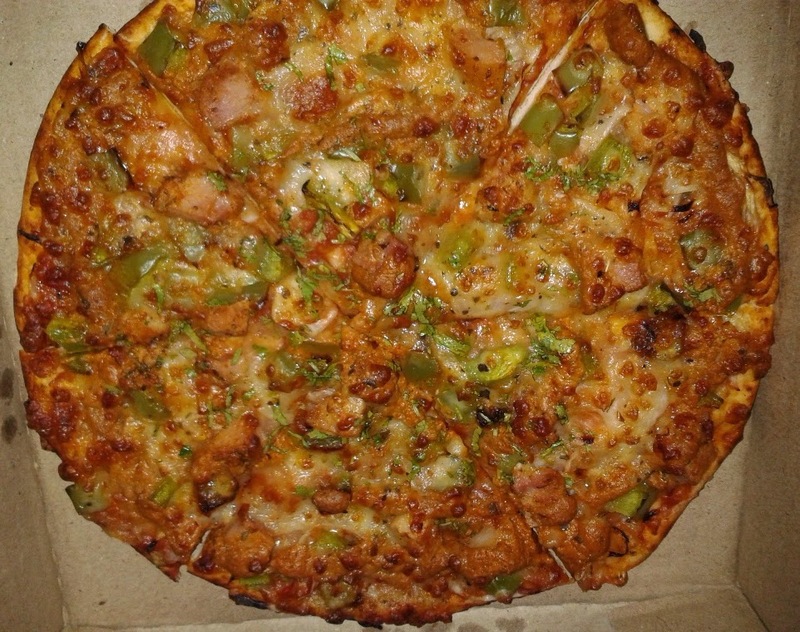 Chicken Makhani or Butter Chicken pizza had a better visual appeal but suffered the same anomalies as the first pizza. Note the sheer number of greens for a meat pizza. This pizza is a classic Indian-Italian fusion and borrows heavily from the North Indian delicacy. However, Debonair's variant did not make the cut. This one felt low on cheese. The chicken tasted much better than the BBQ variant but it lacked the distinct butter chicken flavor which I sought. Captain : The pizza be lacking something. Crew mate: I heard its better across the ocean. Captain : Then, I shall try it across the ocean. This outpost be a disappointment. Debonair's has a lot of potential but they have not tapped into it. The Indian variants feel like poor cousins of the South African variants. Even the menu pictures of the South African branches appear more appealing. One feels that they need to work on the taste and be a bit more generous with the toppings. It is meant to cater more to a mass market audience but even on that front it loses out to the likes of Smokin Joes. They should try and bring the Indian standards up to the South African one. Would be fair to say that the pizzas lacked pizzazz. Pizzas can be expensive without offers. So it is better that you order on a day with the offers. The offers change depending on the weekday so you may not get a free pizza every time. On a positive note, I found it funny that they named a pizza Jonty. Clear reference to the popular South African cricketer who has a huge fan base in India. "All righty lads, back to the salty seas for us. Let's see where the winds take us next time." A Blog dedicated to my voyages of the epicurean kind. Tuskers at Sofitel - BKC, Mumbai. 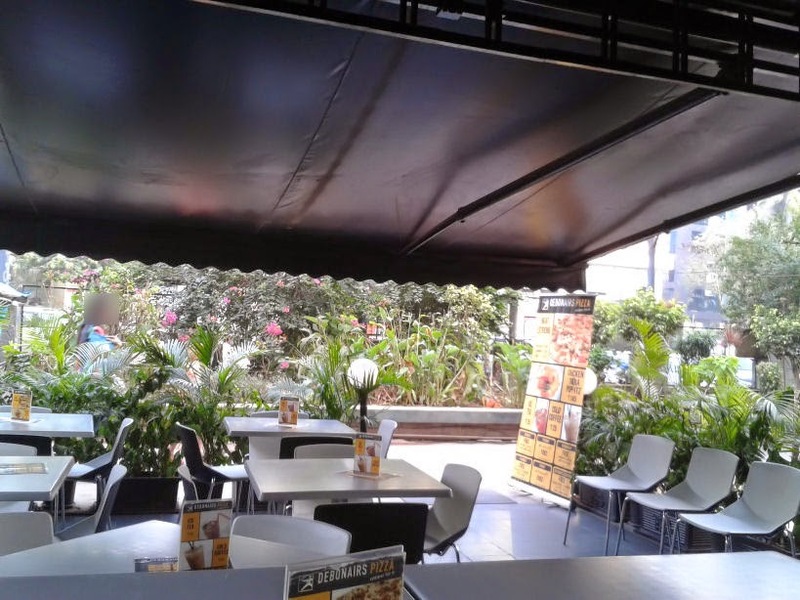 Ellipsis Bakery - Worli, Mumbai. Copyright © Rishabh Mittal 2014-. Picture Window theme. Theme images by piskunov. Powered by Blogger.